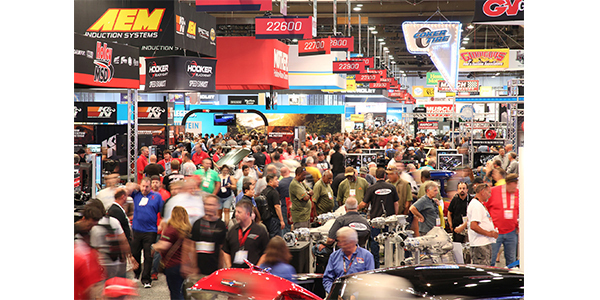 Registration for the trade-only 2019 SEMA Show is now open at www.semashow.com/register. The annual trade show, where the $43 billion specialty automotive industry will come together to conduct business, is set for Tuesday through Friday, Nov. 5-8, in Las Vegas. Attendee: Distributors, retailers, installers, buyers and those in public relations and marketing should register using the “Attendee” link. Applicants may be required to submit proof of employment in the industry. In addition, approved domestic attendees who register and choose the “Click To Confirm” link in the emailed confirmation before Oct. 11 will receive their badges in the mail. Approved international attendees who register before Sept. 13 will receive their badge at the international address provided in their application. Badges begin mailing in late August. Attendees may sign up for special events and seminars during the application process or by using the “Special Events Tickets Only” link at www.semashow.com/register. Among the special events are those offered by the SEMA Show Education program, Society of Collision & Repair Specialists (SCRS), Tire Industry Association (TIA) and Inter-Industry Conference on Auto Collision Repair (I-CAR), adding up to more than 100 sessions addressing all aspects of small business, industry trends and opportunities, collision repair, professional development training, Advanced Vehicle Technology and more. Exhibitor badges are not to be used for non-employees, including contest winners, contractors, customers and vendors. Exhibitors from the U.S. and Canada who register before Oct. 11 will receive their badges in the mail; badges begin mailing in late August. International exhibitor badges will be available for pickup on-site upon presenting a matching government-issued photo ID, such as a passport or driver’s license. During registration, exhibitors also will be able to order complimentary tickets to the SEMA Industry Awards Banquet, which is attended by 3,000 show-goers and considered by many to be the industry’s premier celebration. Media: Journalists, including qualified social media covering the SEMA Show can register for complimentary media credentials using the “Media” link. Applicants may need to supply proof of media affiliation, such as bylined articles or other published work. All approved media will be able to pick up their credentials on-site in the SEMA Show Media Center, a fully functional press room with all the tools necessary to assist with reporting from the event. To register for the 2019 SEMA Show, visit www.semashow.com/register. If you have questions or require assistance registering, contact customer service, Monday through Friday, 9 a.m. to 6 p.m. Central time, toll free at 866-229-3687; international callers dial direct: +1-224-563-3154; or email [email protected].